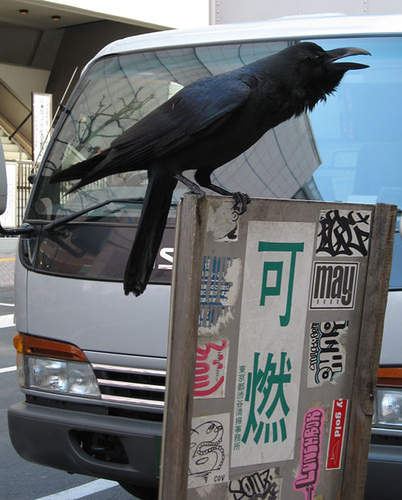 Feeding on urban refuse, Japan's crows are thriving. And these birdbrains are clever. When power companies began removing nests from electric poles because they were causing blackouts, the birds began building decoy nests. But we should expect as much from a bird that back in the '90s first learned to crack hard nuts by dropping them on roads for cars to run over, then figured out that the best place on a road to drop nuts was in crosswalks [link to video]. If these guys ever figure out the Internet, we could be in serious trouble. Maybe he's upset that trash collection was early today.